We’d be remiss if we didn’t touch on the best NFL news of the past week – the Raiders hiring Jon Gruden as their next coach. Was it a good hire for the Raiders? Who knows and who cares. 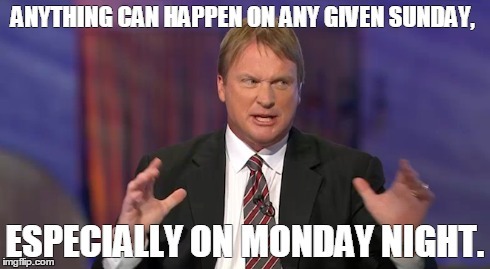 We're just happy that Gruden will no longer be in the booth on Monday nights. After a mid-season swoon which saw the Chiefs lose 3 straight games to the Giants, Bills and Jets, the Chiefs took play calling away from head coach Andy Reid. The Chiefs won their next four, closing out the strong on a strong note. Even with Alex Smith at QB, this offense has so many weapons they should easily score at least 28 points per game. And they’ll need to as the Chiefs defense is so bad that the Jets scored at will hanging 38 points against them in week 13. Good news for the Chiefs, they are not facing the Jets this week or the other two teams from New York State (Chiefs vs. New York: 0-3). They get to match up with the Tennessee Titans. The Titans are one of two teams in the playoffs this year with a negative point differential (the other is the Bills – no surprise there). Of all playoff teams, the Titans have the second lowest point total on the season (lowest – Bills, of course) and have allowed the second most points on the season (do I even need to tell you who is the lowest – yep, the Bills). I wanted to pick an upset here and earlier in the week I thought it just might happen. But when you take a deeper look at this game, the Titans have no business being in the playoffs. The Chiefs offense is too good and the Titans will not be able to adjust to the playoff atmosphere at Arrowhead, one of the loudest NFL stadiums. Take the Chiefs and the under. The only way this game goes over is if the Chiefs score 42. We like the Chiefs to win 24-3. In 2016, the Rams were 4-12. In 2017, the Rams finished the regular season 11-5. An amazing turnaround, especially considering that no major changes were made to the team. Well, there was one major change – the removal of Jeff Fisher as head coach. Without Fisher, the defense finally lived up to its potential and the offense took off with new head coach Sean McVay calling the plays. The Falcons snuck into the playoffs with the 2nd wild card. But don’t underestimate this team. As long as Matt Ryan throws to the correct team, the Falcons should be good. One weakness the Rams D has had this season is versus the run. Devanta Freeman should have a great game and it will open up the field for Julio Jones and Mohamed Sanu. The Rams D is top 5 in the league in turnovers generated. If Atlanta can protect the ball and avoid turnovers, they have a great shot at winning this game out right. And check out this interested stat we dug up (re: stole from Twitter). Remember: Rams in 2016 - 4-12. Rams in 2017 - 11-5.